I took these slides over fifty years ago. 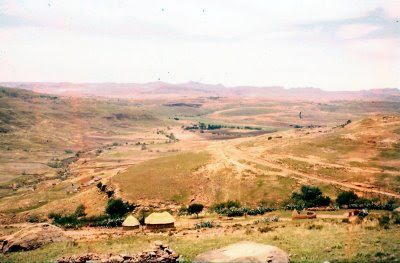 They are very faded but you can see the extent of the erosion with the African huts surrounded by deep gullies(dongas).Click it to see it more clearly. Degradation of the grasslands is going to be one of the greatest problems in the country with increasing population and land redistribution.See the little figure of the man in the red shirt. 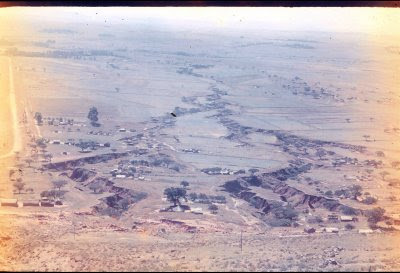 The causes of this erosion may be overgrazing, cattle paths which soon form gullies or cultivation without protecting the lands from excessive runoff.As the water gathers speed it removes some soil making small gullies which in turn causes the water to run even faster by concentrating it in a narrow area, and therefore a feedback loop. Slowing the water down in early stages by building small walls of stone or even earth can do wonders. Sometimes putting stones on a contour can also help or keeping the water out of the early furrows can help. Of course preventing overgrazing is vitally important allowing strong root growth and a dense cover. The reason these gullies are as deep as this is because of the very erodible subsoil in this area. Once formed the situation is dire. The lands nearby have their water table lowered, so much so, that crops soon fail, even with reasonable rainfall. Many do not consider filling them to be practical but I have seen the results where walls of gabian baskets have slowed the water to such an extent that if the catchment above brings sufficient silt down the dongas are filled. 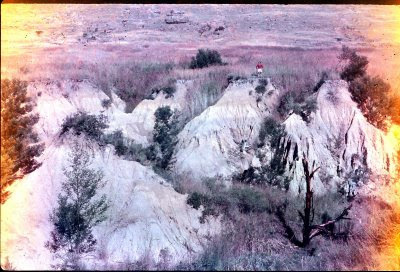 In 1957 many of my photos were taken with Anscochrome with an Exposure Index (E.I.) of 32 and later 100, 32 was three times faster than existing color films. The slides have all faded badly over the years whereas Kodak slides are still perfect. 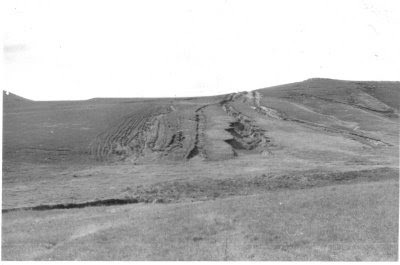 The black and white picture shows the damage caused by cattle paths.The bottom picture shows erosion all around the houses where cattle were brought down from the mountains and concentrated during the cold winters with very little conserved fodder.Note the very badly eroded stream on the left and the very poor grass cover generally. 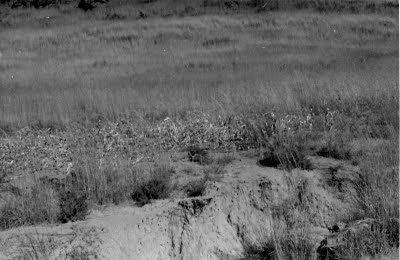 Even during the summer this grass was unable to recover as there were horses and other cattle keeping it short. If the areas could have been fenced off and rested they would have recovered to a great extent.As a demonstration I had and area of about an acre fenced off and within a few months in summer the grass (Mostly Hyparrhenia hirta) was waist high. 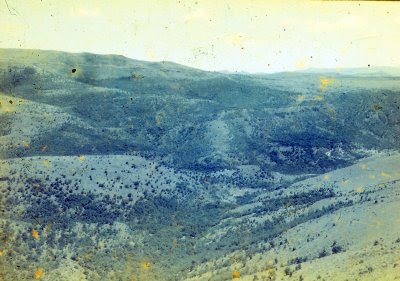 These were taken in 1959 in what was known as Witsieshoek, and now Qua qua.